If you are a content marketer, you know you need to think like a publisher. But, it is one thing to say it and another thing to make it happen. Whether you are publishing a blog post or white paper, shooting a video or creating an infographic, the process can be complex and tedious, especially when you are churning out lots of content and working with numerous writers and designers. Rally the right resources, sometimes pulling from in-house, outsourcing, or doing a combination of both. Ensure each content asset achieves its aim and incorporates targeted keywords. Manage the review process, which may vary, depending on the type of project. Distribute and promote the content via multiple channels, often staggered over time. Monitor and respond to comments about the content. Measure the results and adjust the strategy while relaying the changes moving forward. When you are desperate to bring some measure of order to this chaotic world, like most marketers you may turn to spreadsheets. Or, you may be force-fitting your processes and workflow into tools intended for another use. Despite your best efforts, you probably find yourself still struggling to keep your head above water. Blogging workflow tools: Focused on editorial project management and search engine optimization. 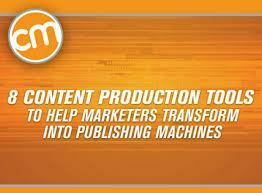 Content workflow tools: Designed to help shepherd content projects from start to finish. Content workflow tools combined with writer networks: Built to support the end-to-end content development process while providing access to a network of writers, if needed. Do I need to support the development of only blog posts or all content types? Does it provide access to outside writers? Does it provide guidance on best practices for content development? Does it support my unique workflow(s)? Does it integrate with my existing blogging and/or content management tools? Can I see a display of the editorial calendar in multiple views (such as by month or content theme)? Is there a central spot for managing projects, drafts and related communications? Does it offer built-in support for keyword research and search engine optimization? Does it include access to vendor personnel who can assist with content strategy, content development, and/or writer management? Does it help manage my content budget and payment to writers? Does it simplify content publishing and distribution? The guide provides a summary of each tool, offers insights into how each is used and includes an “editor’s choice” of our favorite feature. Are you using any of these tools? Share your thoughts in the comments below. And, if you think this guide is helpful, you may also like our Decision Maker’s Guide to Making Smart Content Marketing Technology Choices.